← Agentur für Arbeit – lebt noch im vorletzten Jahrhundert? On the penultimate leave day I was in Mönchengladbach. I attempted to go there in the last month but due to construction works the train had to go another route and stopped before Mönchengladbach because the delay was too big and the railway centre had decided to stop the train before Mönchengladbach. This weekend there are new constructions road on this track so that I have decided to go in my vacation. I took the train line RE42 from Essen to Mönchengladbach main station. The journey took nearly one hour. Only in Mönchengladbach is the shop of „Sportscheck“, a shop for sport clothes. There was a shop in Essen, too but they closed it because it was too expensive. In the shop that is located in a commercial centre I found a long-sleeve shirt for autumn. Sportscheck has reduced the price from 39,99 € to 19,99 € because it could be a discontinued good. It was a warm day but in the morning there was a thunderstorm over Essen and I was not sure what I could do exactly but I wanted to go swim. I should do it now in my leave because in the next week I have the late shift (from 11.15 am to 8 pm) and then I cannot swim after work. 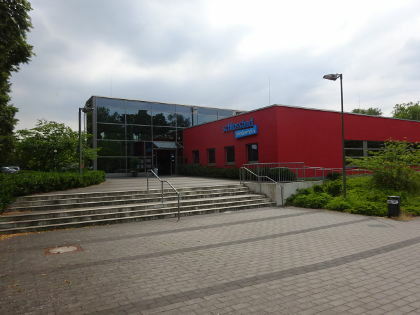 In the south of Mönchengladbach there is a official swimming pool that has an indoor swimming pool and and outdoor part. 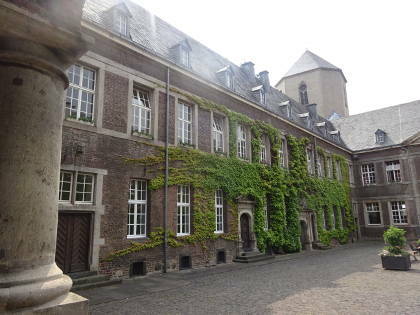 The facility is located in the quarter Wickrath that has a distance about 10 km from the city centre with the bike. There is a street for bicycles that is called „Fahrradstraße“. That means that the bikes have here preference. The car drivers must tolerate that the cyclist can go in juxtaposition with each other. From Mönchengladbach to Rheydt there is a Fahrradstraße that is marked with a blue line. Rheydt is another quarter of Mönchengladbach and has 12.000 inhabitants. There is an own pedestrian area and a stadium (Grenzlandstadion) of the main soccer club plays (Rheydter SV). For two years I was here due a soccer match of my favourite club (SG Essen-Schönebeck) that played against Borussia Mönchengladbach. It was a match of women soccer and Essen won it with 3:0. After one hour I found the swimming pool. The entry cost 5 Euro for the whole day. I took the entrance of the outdoor area and change my clothes in the changing room. The swimming pool has outside a lot of little pools but no big one (50 Meters) for lane swimming. There is a small one inside with 25 Meters. Here is a slide, too. I stayed more than two hours. Enough for me because I wanted to eat something and not little things from the bar in the swimming pool. On the way there I saw a café, restaurant and there I wanted to do a stop. I ate and drink something and could have a stable internet connection via a hotspot for one hour. I only wanted to test it and called up my mails. It is very nice with my tablet. The tablet and the internet in general is always an aid in order to get better and faster information and perhaps better communication. But the real communication from face to face it can not replace. Unfortunately a lot people are getting in contact with each other but only a fraction wants to do the contact in real life. I regret it. From this café to the main station of Mönchengladbach I took only 30 minutes and reached the train to Essen. But the departure of the train (RE42) took more minutes because there was the usual fault of the railway signal. The train had a delay about 10 minutes. 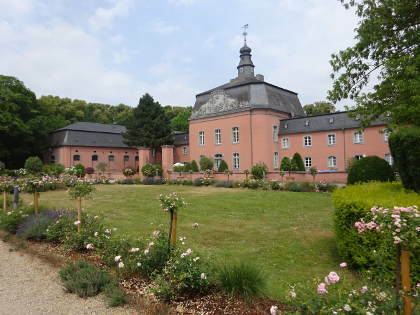 Dieser Beitrag wurde unter Ausflüge, English, Schwimmen abgelegt und mit castle, Fahrradstraße, hotspot, Mönchengladbach, RE42, Rheydt, swimming, Tablet, Wickrath verschlagwortet. Setze ein Lesezeichen auf den Permalink.